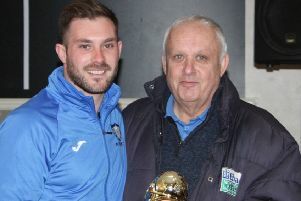 The new Northern League season gets underway this weekend and Whitley Bay completed their pre-season programme with three big wins in the space of five days. The most impressive performance by Andy Gowens’ new look side came last Tuesday evening when they travelled to Blyth Spartans and defeated the National League North side 4-2. Continuing on their travels, they then enjoyed victories against Northern League Second Division sides Heaton Stannington, 6-1 and Ryton & Crawcrook Albion, 5-2. Whitley start their competitive season at home to Seaham Red Star on Saturday, kick off 3pm, in a Northern League First Division that has been reduced to 19 clubs following the resignation of Team Northumbria. Only three regular members of last season’s Bay side remain at the club, long serving defender Callum Anderson, goalkeeper Tom Flynn and captain Peter Glen-Ravenhill. Among the new signings, striker Jack Foalle has made a flying start, with eight goals in the seven pre-season games. Whitley’s first away game is next Wednesday evening when they travel to FA Vase finalists Stockton Town, where kick off is at 7.45pm.